We are pleased to announce that the Fair Workweek Initiative (FWI) is expanding and becoming a joint partnership between Organization United for Respect (OUR) and the Center for Popular Democracy (CPD). Working with community and labor partners across the country, we have achieved tremendous strides in promoting stable workweeks that provide balance and economic security for working families. With over 1.8 million people now covered under fair workweek laws, we are excited to grow our capacity to support coalitions across the country and activate working people in the movement for a family-sustaining workweek. The core of the fight for a fair workweek is about giving working people a voice and stability in a changing economy. Now with new technologies automating work, intensifying financialization and corporate monopolies undermining worker voice and eroding job quality, we need bold strategies that build long term power for working people. By joining OUR and continuing a deep partnership with CPD and its network, the Fair Workweek Initiative team will grow its capacity to develop innovative responses to these new challenges facing working families in the retail sector. 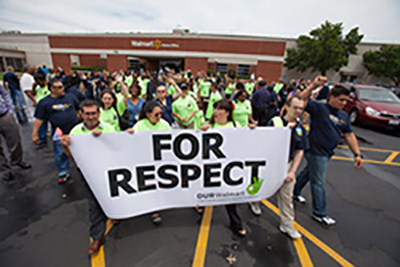 OUR, a growing CPD affiliate, is a movement leader in amplifying the voices of people working in retail who are on the frontlines of a changing and increasingly volatile economy. Combining innovations in technology, online to field organizing and leadership development, OUR has advanced new ways to activate and empower working people. Aligning with a growing network of workers and working in collaboration with the CPD Network, FWI and OUR’s new joint strategies will include innovations in worker rights enforcement, civic participation, and a broader policy agenda that addresses the changing nature of work in retail. As tremendous movement gains in raising wages and winning a fair workweek, earned sick time and family leave are under attack, FWI, OUR and CPD are excited to work together on a new online-to-field civic engagement program that will encourage working people employed in hourly service jobs to vote. In September, FWI’s Director Carrie Gleason, Campaign Manager Terrysa Guerra, and Corporate Strategies Director Lily Wang will be joining OUR’s staff while staying closely engaged with CPD and our full network of affiliates. Supervising Attorney for Worker Justice Rachel Deutsch, who helped design the state and local fair workweek policy innovations, will remain at CPD and will continue to provide policy support for fair workweek campaigns and the broader economic justice policy agenda. Stay connected to the work of the Fair Workweek Initiative at fairworkweek.org.